Fill out the information above, & we will call you for our first social chat for free. Social Chat is a MemoryBeach original service, designed by a psychologist, to connect people-to-people through intentional conversations about the hobbies, activities, and events that shape peoples’ lives. You can sign yourself or someone else up for regular 1:1 conversations with a MemoryBeach LifeGuard, who is specially trained and vetted to provide social conversation with someone who wants to talk about things that interest them. Social Chat also serves as a reminder service: for appointments, birthdays, anniversaries, and other events. Register an account on MemoryBeach, and you can indicate multiple events in someone’s life. We’ll remind that person of the event as well as offer a 5% discount on all MemoryBeach products and services on that particular date. For the first chat, pay nothing. We interview you for things you like to talk about: sports, family, hobbies, or any other topic you'd like to discuss. We use the internet to access to thousands of topics, and will prepare or your call, keeping careful notes of what you like to discuss. You might not get the same LifeGuard each time we call, but we will keep careful notes about what you like. Each LifeGuard is specially trained and prepared to carry on a fun conversation, and who can be asked to check in on the person’s well being, letting a trusted other know if something seems different from previous conversations. Callers agree that LifeGuards can only discuss topics similar to those one might discuss in a public setting; all calls are recorded and stored. We can set up a shared calendar online with you and loved ones, where we have access to information you'd like to be called about. We can call the Trusted Person on your account, if we attempt to reach you and you don't answer. Schedule more Social Chats here. Light These products are have certain features that make them easy to remember between uses. Epic Epic products require assembly, passwords, knowing how to use the Internet, etc. They come with 1-Month LifeGuard subscriptions. 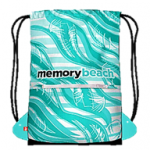 Salutations_LinesToFrom A Mix & Match Stamp is a called a CLIP, a changeable plate that..
Buy Your LifeGuard Gear Bag Here& Shop More MemoryBeach LifeGuard Gear Below&..